Kitchen! Kitchen! 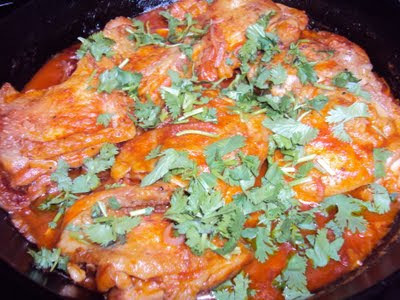 : chicken thighs in chipotle sauce......at kitchen! kitchen! chicken thighs in chipotle sauce......at kitchen! kitchen! Season the chicken parts with the Amazing Dry Rub - see Sept. 1, 2010 posting for recipe. On a large baking sheet- bake the chicken thighs in a 400F preheated oven for 10 minutes and brown by broiling the top for another 10 minutes (this beats browning in oil) then set aside. *I always have a stock of cans of chipotle in adobo sauce - 2-3 chipotle pcs. will go a long way. The rest I put in a jar or small plastic container to store in the refrigerator for my next date with it. 2-3 pcs. of chipotles chopped (make sure to include some of the sauce marinade in the can). Sautee the onions and garlic in a hot pan with olive oil until translucent and the swirling aroma is making you want to join in. Add the dice tomatoes; cardamon pods; tomato paste; chipotle and a pinch of salt. Add 1/4 cup of broth or water and simmer for a few minutes. Add the chicken thighs and 1/2 a teaspoon of sugar to tone down the acidity and let simmer for another 15-20 minutes until chicken is cooked. Taste to correct seasoning.